Legislative power in the State lies with the Oyo State House of Assembly (OYSHA) composed of elected Constituency Members and assisted by Support Staff. The Oyo State House of Assembly has members who are elected for tenure of 4 years to represent the various State constituencies. The House Committee Chairman as key officers. The Legislature has oversight function over the Executive arm, and the Local Government Councils (LGCs) of the State. To advance the cause and interest of the people of Oyo State through effective Legislation and representation. A House of Assembly set to enact enabling laws for good governance in Oyo State, representing the interest of our people and ensuring value for State expenditure. To hold debates in which the Government in which the Government is given opportunity to explain and justify its policies to the electorate and educate the people in the merits of alternative approaches to leading issues of the day. To preserve the constitutional rights of the individual in his relationship with the administration. To approve measures for raising revenue and control expenditure. To make laws for the good government of the State. Principally, the State House of Assembly is to make laws for the peace, order and good governance of the State in respect of matters not in the Exclusive legislative list but in Concurrent list. It could also legislate on other matters with which it is empowered by the Constitution to do so. Membership of the State House of Assembly is based on constituency arrangement of the State for effective representation of the populace. Each member therefore represents a section of the people in the State (Constituents) for avoidance of marginalization in the scheme of things. Before any Bill is passed into law, or a resolution taken on any matter before the House, members must procedurally, engage in a careful and meticulous deliberation of all the facts therein, to arrive at definite and worthy decisions. The House of Assembly participates in the appointment process. Under Section 192(2) persons nominated for appointment as Commissioners, State Chief Judge, Board Members and Chairmen of Parastatals etc. require the Confirmation of the State House of Assembly for such appointments to be valid. This function is contained in Section 88 of the 1999 Constitution. Here the State House of Assembly is empowered to carry out investigations within its competence to prevent and expose corruption, inefficiency or waste in the execution or administration of laws. It is empowered to procure evidence, written or oral, direct or circumstantial as it may deem necessary and also to examine any witness whose evidence may be material to the subject matter. The primary aim of this function is to promote efficiency, transparency and due process in the running of the affairs of the State. The State House of Assembly performs this important function through the impeachment and removal from office, of members of the executive. Under section 143 and 188′ of the 1999 Constitution, the State Governor and his Deputy are liable to impeachment. This is the process by which the legislature formally brings charges against the Governor or his Deputy with a view to his trial and removal from Office if found guilty as charged. The State House of Assembly is empowered to regulate its Proceedings including control over the conduct of members during Sessions. Such members or even non-members may be tried summarily for contempt and punished without the right of appeal to law Courts. Again the State Assembly can conduct a trial as if it were a Court of Law. It may thus issue a Warrant to compel the attendance of any person who, after having been summoned to attend, fails to do so. The Oyo House of Assembly is saddled with the responsibility of making laws for peace, order and good governance of the State. The House acts as a control value to the Executive Arm of Government by ensuring that public funds are prudently expended on Government projects through its oversight functions. The Legislature also acts as an arbiter for human rights by considering complaints and petitions from the Public thereby performing a quasi-judicial function. Investigation into any Government activities to ensure probity, accountability and transparency or to expose corruption, inefficiency or waste in the execution of Government projects and programmes. 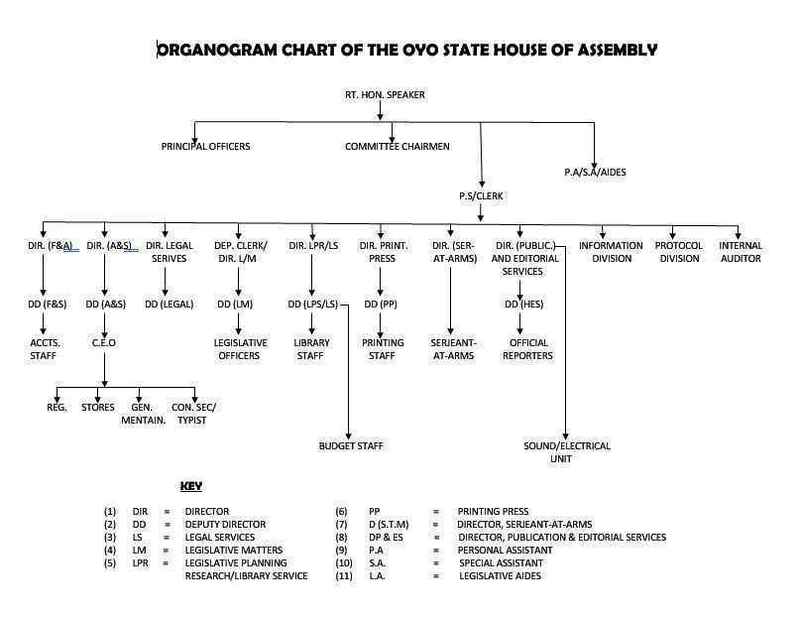 The Oyo State House of Assembly carries out the major parts of its function through the Committee system. On a general note, the House Committees are referred to as the engine room of the legislature. Some even refer to the Committees as the hub of the business of the House. For the purpose of efficiency and effectiveness, the House has divided itself into Twenty-Five (25) Standing Committees. The Plenary Sessions are also important. Here, major decisions are taken or ratified. Bills are passed into laws. Motions are also debated and passed into Resolutions. (1) Production of 198 pages document on Administration of Criminal Justice Bill. (2) Procurement of Media Equipment like Professional Cameras and setting up of Website and Media Section. (3) Re-Roofing of Printing Press Section and Hanzard/Editorial Department. The Oyo State House of Assembly has its origin in the old Western Regional House of Assembly. The foundation stone of the Parliamentary Buildings was laid on Tuesday, 1st March, 1955 by Sir. John Dalzell Rankine, while the official opening was done by Her Majesty, Queeen Elizabeth II on the 15th February, 1956. The British Parliamentary System of Government continued until 15th January, 1966 when there was a Military putsch which lasted for about 13 years. On 1st October, 1979, the Country was returned to democratic rule, adopting the American Presidential System of Government. The present 8th Assembly is made up of young-men and women of vigor and vitality and elders with wealth of experience in various professions and walks of life. Since its inauguration in June, 2015, the House has been up and doing and has contributed immensely to good governance in the State. The House has been able to pass several Bills into law, while many Resolutions were adopted for implementation by the Executive. Then Members and Officials have undergone various trainings and attended workshops. The essence of the training was to sharpen the legislative skill of the legislators for effective performance and to achieve best legislative practices; Kudos to the Executive for supporting the House in this regard. It is worthy of note that the House has maintained a healthy and friendly relationship with the Executive Arm as well as the judiciary. The House acknowledges the support and cooperation of the Executive for providing enabling and conducive environment for the House to perform. The House hopes to continue to further the best interest of the people of Oyo State through people-oriented legislation and other legislative activities.